The revolution has brought new challenges. But the forces of democracy in the country are being challenged by darker elements in their midst. Tunisia has been troubled by repeated terror attacks this year, and is now believed to contribute the highest number of fighters for Islamist terror group ISIL. 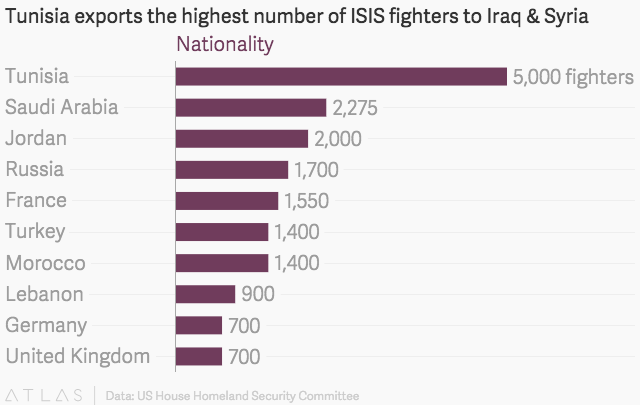 According to the latest data from the US House Homeland Security Committee, of the 25,000 fighters thought to be working for ISIL in Iraq and Syria, 5000 are Tunisian. This delicate period, while it has opened up the democratic space, has not eased the economic challenges the country is facing, which analysts say has created an opening for ISIL to exploit. Four years after the revolution Tunisia’s economy is contracting. After 2.3% growth in 2014, the World Bank and IMF project GDP growth for this year at a measly 1%. Overall unemployment is at 15.2%. And for university graduates, unemployment is even worse at a staggering 34%, estimates the African Development Bank (AfDB). All these factors have created deep disillusionment about post-revolutionary Tunisia. And ISIL recruiters have exploited this air of dissatisfaction to devastating effect, luring young people to their cause. They offer monthly salaries of up $2,000 and the promise of a life of meaning, fighting to correct injustice as epitomized by Bashar al-Assad’s regime in Syria. Where jobs are scarce and those who can find them earn meager wages of $100 a month, what ISIL is offering has proved to be a compelling alternative.